Fans of the movie Titanic have all wondered what became of the original Heart of the Ocean necklace. The beautiful blue diamond necklace served a crucial plot point in the romance between the lead characters and the tragedy of the ill-fated Titanic voyage. Replicas of the necklace are still popular today. The Heart of the Ocean necklace was a fictional priceless jewel that was created exclusively for James Cameron's 1997 movie, Titanic. The necklace worn by Kate Winslet's character in the film was an impressive prop that resembled a real 56-carat blue diamond surrounded by white diamonds, hung on an 18 inch white diamond-studded chain. The famous Hope diamond and the blue diamond in the 1943 Titanic film inspired Cameron's Heart of the Ocean necklace. The necklace follows a similar storyline to the Hope diamond. Both jewels were once possessions of the French King Louis XVI. Louis XVI wore the Hope diamond as a necklace. In the movie, the Heart of the Ocean was a rare blue diamond that was once worn in Louis XVI's crown. The diamond goes missing after Louis XVI's execution. It is later recovered cut into a heart shape and becomes known as the Heart of the Ocean. In the 1943 film, the blue diamond jewel, like the Heart of the Ocean, was also an important plot point. The 1943 film jewel had a dramatic impact on a romance between lead characters and symbolized the loss of love and life in the Titanic tragedy. In the movie, the Heart of the Ocean is a large blue heart-shaped diamond surrounded by smaller white diamonds and hung on an 18 inch diamond laden chain. The necklace used on the Titanic set was a 1 ¾ inch long semiprecious sapphire set in white gold that was high quality costume jewelry. However, the jewelers Asprey & Garrard created a real diamond version of the necklace after the movie was released. The Asprey & Garrard necklace is considered the original Heart of the Ocean necklace. Asprey & Garrard created a 170 carat heart-shaped Sri Lankan sapphire surrounded by 103 round white diamonds that totaled 30 carats and hung on an 18 inch white diamond-studded chain. Celine Dion wore the Asprey & Garrard Heart of the Ocean necklace at the 1998 Academy Award ceremony during her performance of the Titanic theme sone, "My Heart Will Go On". 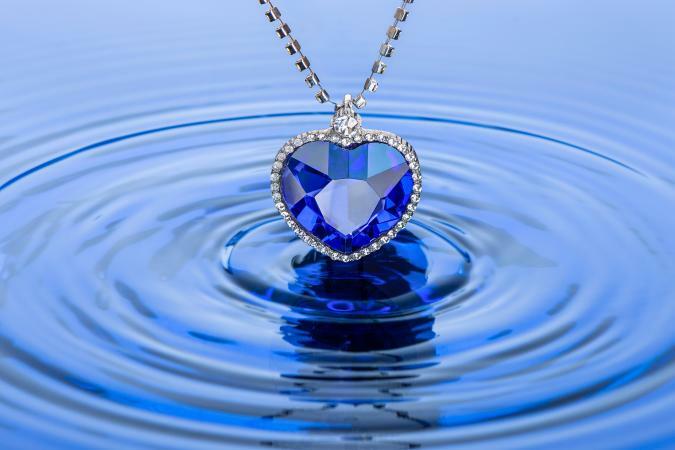 The Heart of the Ocean necklace made by Asprey & Garrard was sold at a charitable auction for $1.4 million with the condition that it be worn by Celine Dion at the 1998 Academy Awards. The necklace was eventually donated to the Charlestown Shipwreck & Heritage Centre (formerly the National Shipwreck Museum) in Charleston, Cornwall, UK where it remains on display today. What exactly happened to the Titanic necklace movie prop worn by Kate Winslet? No one has ever publicly commented on its whereabouts. 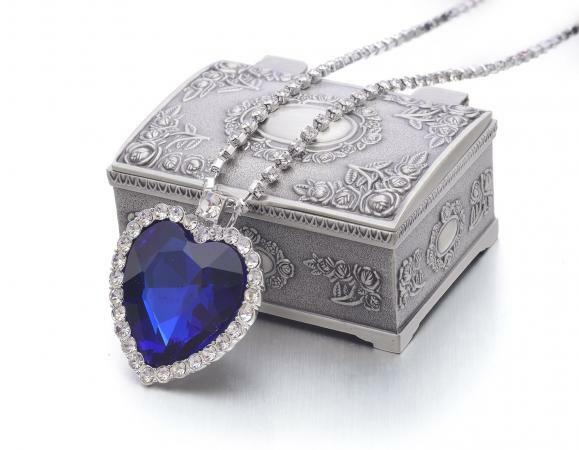 A number of jewelers created high quality replicas of the Heart of the Ocean necklace soon after the release of the 1997 film. Many replicas are fashion jewelry made of Swarovski Austrian crystal and are quite affordable to the general public ranging in price from $25 to $80. 20th Century Fox released an official movie replica crafted by J. Peterman that closely matches the design of the original movie necklace. The Peterman necklace is a heart-shaped blue crystal necklace surrounded by white crystals on an 18 inch necklace with 84 cubic zirconias set in rhodium mountings. The J. Peterman replica originally retailed for $198 when it was first released. Now the hard-to-find limited edition J. Peterman replicas range in price from $200 to $300, depending on the seller. Each J. Peterman replica comes with a certificate of authenticity from 20th Century Fox. There are also some fine jewelry replicas that costs thousands of dollars. The most famous fine replica was a $20 million necklace created jeweler Harry Winston. Actress Gloria Stuart, who played the elderly Rose DeWitt Bukater Calvert, wore a 15-carat blue diamond replica of the Heart of the Ocean at the Academy Awards ceremony. Heart of the Ocean necklace replicas are still available online and in many collectible stores around the world. Replica prices vary depending on the quality of the materials used. Prices range from as low as $25 to over $5,000. Cyper Depot: Cyper Depot offers a replica of the Titanic necklace made out of Swarovski crystal for $34.99. Both the pendant and the 18 inch chain contain crystals. Amazon: The online giant sells many replicas of the famous necklace. Prices range from roughly $6 to $70 for pieces of varying quality. Titanic Branson Store: The Titanic Museum's online store sells a Heart of the Ocean replica necklace priced around $100. Ebay: Ebay is a good place to look for J. Peterman Heart of the Ocean replicas and other vintage Titanic necklaces. The Heart of the Ocean necklace appeals to both fans of the movie and hopeless romantics everywhere. Replicas of the necklace make great Valentine's Day gifts or any occasion when someone wants to give a romantic gift to a loved one. This necklace is as much of a classic as the movie.